DUBAI -- Housing crisis? Mortgage meltdown? Credit crunch? After spending a few hours at Cityscape, this Mideast boom-town's annual real-estate trade show, you just might forget about the financial crisis gripping much of the rest of the world. VIP Visitor Pass - SOLD OUT! Click "Read More" to view the rest of the entry and to find out the Hollywood celebrity who visited the exhibit last year. The four-day event attracts the region's biggest property developers, contractors, interior designers and investors. Never mind that many of the projects introduced here with great fanfare may never get built. Dubai property prices have rocketed in the few years since the United Arab Emirates opened its market to foreigners. However, sky-high oil prices that have long fed the region's economic boom are falling back. Borrowing costs have soared amid a regional credit crunch. The government has been investigating a handful of the city-state's top real-estate and lending firms. And international and domestic investors are taking money out of the region's once-frothy stock markets. Still, exhibitors inside the show's sprawling exhibition halls presented an optimistic picture. On Sunday evening before the show, Nakheel, a Dubai-government-backed property developer, invited guests including the acting couple Catherine Zeta-Jones and Michael Douglas to the pink Atlantis hotel at the tip of its man-made, palm-shaped archipelago. 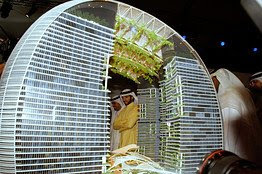 The occasion was the launch of Nakheel's latest project: a kilometer-tall skyscraper. The $38 billion project is supposed to someday tower above the world's current tallest building, Burj Dubai, itself nearing completion here. "I'm sure most of you are asking why we're launching this, and you'd be mad not to question it," Nakheel's chief executive Chris O'Donnell said. He added, "The project will be built over 10 years, and we'll have many more [economic] cycles before then...the world will be a different place by the time it's built." Dubai Properties, meanwhile, said it had started selling residential units in the first phase of its $21 billion "Mudon" project. Its five residential centers will feature architectural flourishes recalling the ancient Middle East cities of Baghdad, Beirut, Cairo, Damascus and Marrakesh. "There are just too many developments under construction that are coming online in the next two or three years," said Waryn, an American executive who moved to Dubai from London. "The supply and demand balance are going to be out of whack and the prices will come down."